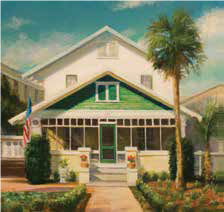 Nestled in the heart of downtown Winter Park, the historic Kummer-Kilbourne House will celebrate its 100th birthday with a free and public open house on Saturday, February 20 from 10 a.m. to 2 p.m. Winter Park Mayor Steve Leary will issue a proclamation at 11 a.m. Visitors will be able to tour the property, which was purchased in 2012 by real estate investor and developer Allan Keen and his wife, Linda. The Keens meticulously restored it – retaining 90 percent of the existing Craftsman-style bungalow and all of the walls. The original hardwood floors, fixtures like sinks and medicine cabinets, and even a concrete planter on the front porch, date back to 1916. The Kummer-Kilbourne House, which was built in 1916 by lumberyard owner Gotthilf Oscar Kummer, had remained in the family for generations. Today, it is home to The Keewin Real Property Company. In 2004, the house was listed in the Winter Park Register of Historic Places. It also was placed on the National Register of Historic Places by the United States Department of the Interior. Keep The Capen House: Move It Or Lose It!